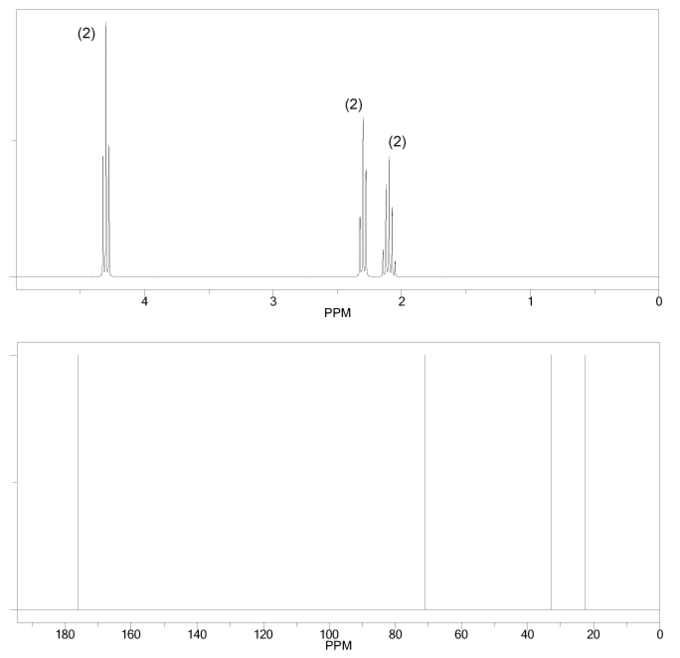 The 1H and 13C NMR spectra of a compound with chemical formula C4H6O2 are shown below. The compound's IR spectrum shows a sharp peak at 1,700 cm-1. Determine the structure of this compound. 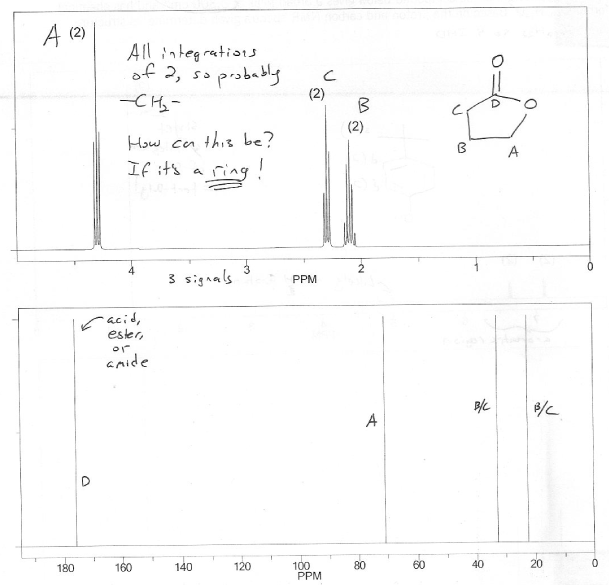 For a detailed explanation of the general strategy for solving NMR structure elucidation problems, see problem 662. 1. Are there any any hints? Yes. The sharp IR peak at 1,700 cm-1 tells you this molecule contains a carbonyl (C=O). C4H6O2 is the same as C4H6 (oxygens can be ignored) which if fully saturated would be C4H10 (from CnH2n+2). So this compound is missing 4 H's (C4H10 - C4H6), which corresponds to 2 IHD. 3. Draw some C4H6O2 structures with 2 IHD and eliminate, learn, repeat. From the IR we know this molecule must have a carbonyl group. This "uses" 1C, 1O, and 1 IHD so we have 3C, 1O and 1 IHD remaining to work with). What is the the remaining 1 IHD? It's probably not another carbonyl since the 13C NMR shows only one carbonyl peak (~170 ppm). It's probably not an alkene since we don't see any vinyl hydrogen peaks on the 1H NMR (~5-6 ppm). That leaves a ring. Another clue that this molecule contains a ring is that we only see CH2's in the 1H NMR spectrum (all peaks have an integration of 2). The carbonyl peak on the 13C NMR spectrum is around ~170 ppm, which means it's an oxidation state III carbonyl (ester) rather than an oxidation state II carbonyl (aldehyde or ketone). Draw a few structures based on these clues and you'll arrive at the correct answer. MendelSet practice problem # 663 submitted by Matt on July 17, 2011.